The Heubach family bought an established porcelain factory around 1843 in Lichte, Thuringia, Germany, where they were soon producing porcelain figurines. About 1910 they began making bisque character socket or shoulder head dolls, either molded hair or wigged, sleep eyes or their famous painted intaglio eyes. One secret to Heubach's success was the location of an Art School for artists and sculptors located near their factory, some of the artists names are: Holwein, Krieger, Niemeyer, Wera vonBartels, Zeiller and Zitzmann - whose initials maybe included in the doll marking. Gebrüder Heubach doll marks; the word Heubach inside a square or quadrant, a Sunburst symbol, a triangle with initials ALS, a cloverleaf symbol. 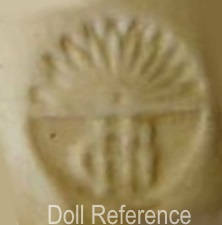 Note: German doll makers Gebrüder Heubach & Gustav Heubach both used the doll mark GH. 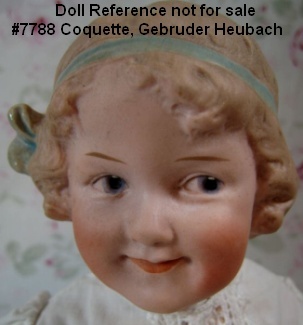 Gebrüder Heubach Coquette doll mold 7788, 10" tall, blue molded painted hair bow, painted molded hair, coy intaglio painted side glancing eyes, a precocious half smiling mouth, socket head on a bent limb baby body or shoulder head on a kid body with ne plus ultra riveted hip joints. Gebrüder Heubach elderly Lady doll mold 9417, character doll, a bisque shoulder head, she has wrinkled facial features, closed unsmiling mouth, white wig, dressed in appropriate clothing. There is also an elderly Eskimo doll or native American Indian doll mold 8457 or 9457. G. Heubach's 9400 series dolls are quite rare. Some named G. Heubach doll molds; 6736 Laughing Boy with two lower teeth, 5730 Santa, 5777 Dolly Dimple, 6970 Pouting Character, 7684 Screamer, 7746 Laughing Boy, 7761 or 7843 Spinach Boy or Tantrum Baby, 7764 or 7851 the Singing Girl or the Singer, 7788 or 7850 Coquette, 7865 Jubliee Doll, 7877 or 7977 Baby Stuart doll, 8035 Brother, 8050 Girl smiling with hair bow, 8058 Laughing Sister, 8381 Princess Juliana, 8545 Baby Grumpy, 8774 Whistling Jim with intaglio eyes, 8776 Whistling Jim with glass eyes, 9101, 9102, 9103 Cat, 9141 Winker, 9145 Smiling Boy, 10490 Elspeth, 10586 or 10633 Dainty Dorothy doll, 11173 Tiss Me doll, Chin Chin all bisque Oriental baby dolls (1920s), Elisabeth a googly eye doll and Heubach's Piano Baby figurine dolls. 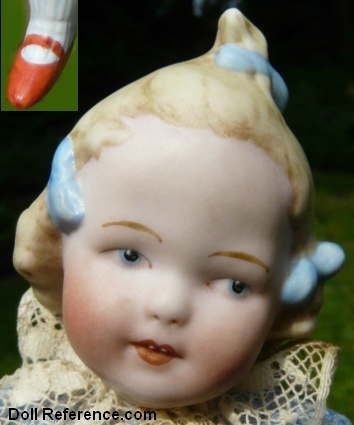 Gebrüder Heubach also supplied bisque doll heads to Eisenmann & Co marked Einco Heubach. Jumeau ink stamped bodies have been found with Gebrüder Heubach marked heads.